If you go sightseeing in Yokohama, HANEDA AIRPORT EXPRESS is your first choice! It takes you to Yokohama from Haneda Airport non-stop and once the bus arrives in the city, it stops at major hotels and sightseeing spots. 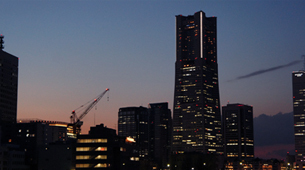 It guarantees you a convenient and comfortable holiday in Yokohama. Arrived in Japan! Let's go to a city of fascination, Yokohama! 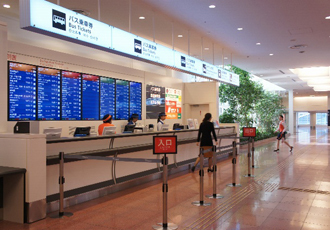 The Bus Ticket Sales Counter is in front of you on the left as you exit the Arrival Lobby on the second floor of the International Terminal. It is easy to buy a bus ticket. 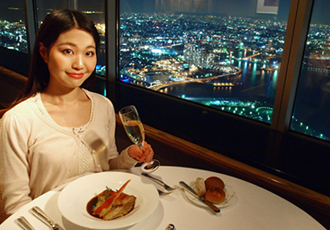 All you have to do is to say, "Yokohama Grand Intercontinental Hotel ma'de." If you can’t find the bus stop, the kind staff will show it to you. The fare is 720 yen for adults and 360 yen for children. Please be reminded that you are required to reserve a seat on a bus back to Haneda Airport. Your bus is white with a red line and leaves from the bus stop No. 7. Please give the ticket to the driver as you board. If you have any large baggage, just give it to the staff before boarding. The staff will put it in the bus storage compartment for you. Now, you can travel light to the hotel! Look at those many red and white cranes. They are called "giraffes." Do you think they look like giraffes? 1-1-1 Minatomirai, Nishi-ku, Yokohama, Kanagawa-Pref. When Yokohama is introduced on TV such as in dramas or commercials, this hotel is always in them. At this hotel, you can enjoy Yokohama’s best view from the guest room windows, including an urban development area, Minato Mirai 21 and the Bay Bridge. The night view is particularly stunning. The hotel offers a variety of room types including a Japanese room suite which is popular among overseas visitors, so a lot of customers come back to stay here again. This is one of the leading hotels in Yokohama so service offered here is excellent. It has a variety of restaurants so that you can enjoy food from around the world. The superb view of the harbor and buildings will give you the ultimate relaxing experience. You can find relief from your weary journey and get ready for your exciting holiday. What comes to mind when you hear the word "Yokohama"? Most Japanese would answer, 'the Chinatown.' The Chinatown in Yokohama gives out a great presence and is world famous as Japan and East Asia’s largest Chinatown. There are about 600 Chinese restaurants and variety shops in an area of 0.2km². A variety of Chinese architecture including the Yokohama Maze Mausoleum is scattered around the area. Particularly, a temple of prosperity, Kanteibyo, Kuan Ti Miao Temple, is popular among young Japanese people who pray for good economic fortune. The Chinatown offers many places of interest so you will not get bored even after spending half a day. No matter if you are a first-time visitor or you have been here before, you can always find something new and be amazed when you eat in the Yokohama Chinatown. You can enjoy food from all regions in China, offered in a variety of styles from authentic full-course meals to casual buffet to food stalls. 1F&3F, Rose Hotel Yokohama, 77 Yamashita-cho, Naka-ku, Yokohama, Kanagawa-Pref. There are many unique shops selling Chinese sundry items, cooking ingredients, cookware, antiques and furniture. Just look around in the shops for an hour or so, and you'll find yourself excited about so many items you want to buy. Don’t be shy, talk with the shop people, and get some good-quality stuff at bargain prices. Yamashita park 279 Yamashita- Cho, Naka-ku, Yokohama, Kanagawa-Pref. The Hikawa Maru was operating as a passenger ship crossing the North Pacific until 1960. The ship was called "The Queen of North Pacific" because of her elegant appearance and the best service offered. She is also famous for the fact that many celebrities such as the King of Comedy, Charles Chaplin of the United Kingdom and the members of the Takarazuka Revue Company which performed in North America traveled on her. During the war, she was used as a hospital ship and also carried American and Canadian people from Japan back to their countries and brought Japanese people from America and Canada back to Japan. She is the oldest existing passenger ship in Japan. Just walking around inside the cabins, still as luxurious as they were back then, makes you feel as though you were a celebrity from the 20th century. Here, just stroll in the park enjoying the sea breeze! You will see a lot of monuments such as the Girl with Red Shoes Statue, the Water Guardian Statue, a monument with lyrics of a song called "Kamome no Suihei-san" (Seagull Sailors) inscribed, and the Indian Water Fountain. The park is sometimes used for movie and TV drama locations. 279 Yamashita-Cho, Naka-ku, Yokohama, Kanagawa-Pref. The 106 meter-high Yokohama Marine Tower used to be recorded in the Guinness Book of World Records as the world’s highest lighthouse. You can see the whole Minato Mirai 21 development area from the observation floor. You can see Mt. Fuji if you are lucky. You will find nice, cute souvenirs on the 1st floor. 15 Yamashita-Cho, Naka-ku, Yokohama, Kanagawa-Pref. All the historical buildings in Yokohama are facing the sea. Please relax and look at the port town, Yokohama, from the sea bus, which only sailors used be able to see. Over 50 tenants are offering delicious or fun things. You can lick your lips over food or look for cute Japanese miscellaneous items, or you can enjoy various events – the choice is yours. You will lose track of time while shopping here. Also, if you are into sophisticated holidays, you will be satisfied too because this place has cultural facilities such as a concert hall and a gallery space. This is the best tourist spot in Yokohama. Enjoy the combination of the historical buildings and the shops selling the latest items to your heart’s content. The Yokohama Red Brick Warehouse is gaining a global attention as a historical architecture. Its Japan’s first elevator, lightning rod, fire hydrants, etc. have been maintained and repaired, and it received the UNESCO Asia-Pacific Heritage Award for Culture Heritage Conservation in autumn 2010. 1-1, Shinko, Naka-ku, Yokohama, Kanagawa-Pref. 2-2-1-3 Minato Mirai, Nishi-ku, Yokohama, Kanagawa-Pref. The Landmark Tower is the highest building in Japan. It is also famous for many restaurants offering delicious food. The Tower not only has tasty cuisine from around the world, but also has many types of Japanese restaurants. For example, there are Kaiseki, multi-course Japanese dinner, Kushiyaki, skewered food and Shabu shabu restaurants. You will find a taste you love for sure. The night view of the whole Yokohama area that you can see at the restaurant on the 70th floor, Sirius, is particularly stunning. There are many bars and cafes where you can go after a meal as well. Many restaurants here are very popular so it is recommended to reserve a table if you want to enjoy the dinner as well as the night view. 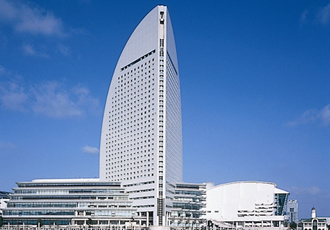 The 70-storey, 296.33 meter Landmark Tower is the highest building in Japan. You can see the Tower from anywhere in Yokohama. The 200 meter-long shopping center, the Landmark Plaza has 170 unique specialty shops such as fashion, beauty and jewelry shops. There is the Garden Square which resembles a square in an European country, and the casual and lively Festival Square. 2-2-1 Minatomirai, Nishi-ku, Yokohama, Kanagawa Pref. The Tokyo Sky tree will stand 634 meters and become the world’s highest tower when completed in December 2011. As of February 12, 2011, it is over 580 meter-high and is already a much-talked-about, popular spot among Japanese people. You can see the Sky Tree from the window of HANEDA AIRPORT EXPRESS for Shin-Koshigaya Railway Station, Kashiwa Railway Station or Hitachi Railway Station. This article was published online in March 2011. 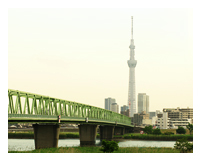 Click here for the TOKYO SKYTREE feature. The construction of the TOKYO SKYTREE was completed in February 2012 and opened in May. You can go up to the first observation deck at a height of 350 meters and the second one at 450 meters. Keikyu Bus has started the service between the Haneda Airport and the TOKYO SKYTREE TOWN on May 22, the opening day of the TOKYO SKYTREE. Go and see the world’s tallest free-standing broadcast tower! This article was published online in June 2012. 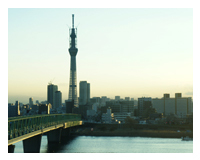 Click here for the TOKYO SKYTREE feature. ・The services for YCAT run every 20 minutes. Please refer to the link for detailed timetables. ・720 yen to the Red Brick Warehouse, 580 yen to YCAT. 210 yen between Yokohama Station and Motomachi-Chukagai Station on the Minatomirai Line.